Captain Linnaeus Tripe is a major, yet now sadly little known, figure in the history of early photography. Whilst in service with the Madras Army, on his first furlough of home leave in England around 1851, he learnt the rudiments of the photographic process and soon honed his skills in composing and taking pictures, as well as becoming a founding member of the Photographic Society of London. 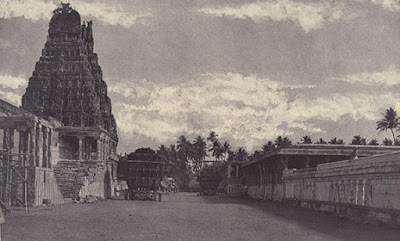 Returning to India in 1854 he created his first major body of work, conducting a photographic survey of the Hoysala temples at Halebid and Belur, which was very well received when he subsequently exhibited in Madras in 1855, and resulted in his first major commission from the British authorities in Calcutta. 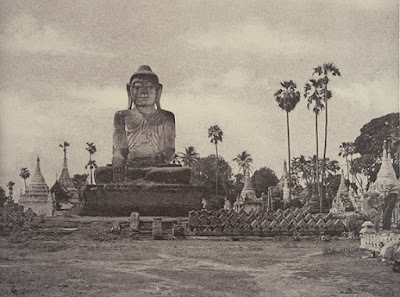 Appointed as an offical photographer he accompanied a British diplomatic mission to the neighbouring kingdom of Burma in August 1855, making a visual record of the journey. 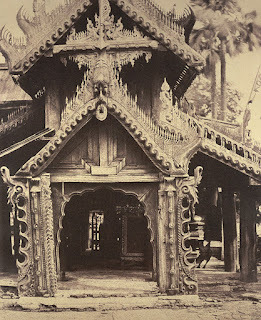 Tripe produced more than 200 paper negatives of sites and scenes within Burma. Recording temple buildings and other places, such as Amarapura – then the capital of Burma, which were later completely abandoned and reclaimed by nature. 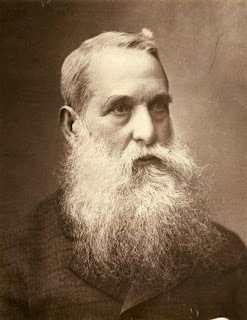 He worked primarily with paper negative techniques as these were better suited to the tropical climate in which he had to work. Yet, due to the colour sensitivities of the chemistry involved in this process, the vivid blue of the skies overhead were often completely washed out, hence he and his assistants had to learn how to retouch the photographic plates by hand. This they managed to do very skilfully indeed. A new exhibition which has very recently opened (on June 24th) at the V&A Museum in London gives an unprecedented chance to view Linnaeus Tripe’s photographs up close. 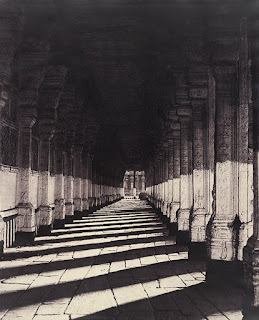 The exhibition which has toured to two previous venues in the USA, at the National Gallery of Art in Washington and the Metropolitan Museum of Art in New York, exhibits around 70 examples of Tripe’s photographs – ranging from his early endeavours whilst on home leave in England to the Burmese mission and other photographic survey work which he conducted in India. I visited the exhibition soon after it opened and found myself utterly absorbed. It is fascinating to examine and contemplate such early processes in photography as well as the nature of the subject matter they set out to document. Both scholarly and artistic in scope, range, style and execution, Tripe’s photographic endeavours are truly remarkable; and all the moreso when one considers that his photographic career spanned little more than a period of five years. As anyone who follows this blog will know, I am deeply interested in colonial era photographs (see Picturing the Past in Colonial Asia). Hence it was a real joy to look at these very early images up-close and in detail. The sheer artistry of the retouching and the effect of the actual photographic techniques is one of the aspects which make these images so interesting. On the one hand, some of them are vividly precise in the level and intricacy of detail they managed to capture, whilst others are rendered almost impressionistically, like etchings with a faded grainy, yet bafflingly precise sort of realism. These really are images which the visual historian can get truly lost within. I couldn’t help reflecting on the multiple epistemological approaches which one could read into, as well as take from, these images. They clearly have an intrinsicvalue as historical documents, both in the sense of the subjects they record, preserving scenes from a vanished world, and as contemporary perceptions of that particular time itself. But they also have the value of being examples of the pioneering techniques of early photography 'out in the field'. Then there is an extrinsic value, if you like, which we as spectators place upon the images as historical documents and visual artefacts. Both of which have interpretativevalues which work on multiple levels too – depending on whether we choose to focus on them as cultural or scientific; political or artistic; documentary or technical experiments; or, a multi-layered and multi-purpose mix of all these aims and intentions. Whichever way we choose to look at them they are unique primary sources of an irrecoverable past, they provide a genuine window onto a former time and a world long since transformed. Looking at Tripe’s original photographs (as opposed to reproductions in modern books or on the internet) one can feel and appreciate their materiality in a way which is impossible via any other means. For me this exhibition is a perfect example of primacy and the importance which is intrinsically endowed in consulting original historic documents firsthand. There is simply nothing like seeing the real thing. This is an exhibition I highly recommend, and certainly it is one which I’d urge anyone interested in visual history or early photographic technology, as well as South Asian temple architecture, not to miss. Images in text - Top: Trumul Naik's Choultry, Madurai, India, 1858; Middle: Major-General Linnaeus Tripe, c.1880s; Bottom: Zhwe Zigong Pagoda, Bagan, Burma, 1855 (All images, The British Library, London ).